What's in a name? If it's a draw to a Southern California conference, a lot! Certain speakers just represent everything special about one particular city. To a point that when you arrive in that area as a meeting attendee, it’s almost natural that you expect to be hearing from that person as your keynote speaker. Today we'll look at the city of Los Angeles. But the city of LA--from a meeting professional's perspective--is defined by Southern California, and so we're looking at meeting destinations from Santa Barbara to Laguna and Newport Beach, Palm Springs and the Desert communities (Rancho Mirage, Palm Desert), Santa Monica to Anaheim, Beverly Hills to Hollywood and Downtown LA. And with 6 major airports touching these communities, there's no shortage of conference attendees eager for a Welcome to LA keynote speaker. When we started our lecture agency here in Los Angeles 32 years ago, that key figure was Pat Riley. With his slicked-back hair and movie star looks, Pat coached The Lakers to 4 NBA Titles and put LA on the map as a Destination of Champions. Celebrities and titans of industry flocked to The Forum to sit courtside. Pat Riley became a household name as a gifted coach who could build champions. He studied business leaders and they in turn studied him. Pat had a book The Winner Within: A Life Plan for Team Players and he had a brilliant speech he called Staying One Step Ahead of The Posse to teach audiences the importance of never letting up because the competition was just one step behind you. Just about every major company and association based here in Southern California invited Pat Riley to keynote their conferences, and when a sales meeting or convention came to LA, Pat Riley wasn’t just the first choice as keynote speaker, he was the only choice. Times may have changed, but the effectiveness of a sports legend at the podium certainly hasn’t. It’s 32 years later. There’s more than one game in town here in Los Angeles for certain. But Magic Johnson has endured. To an outsider (and even to someone born and raised in this city like me), Magic owns this city. He’s shaped Los Angeles and he’s guided this city. He’s now the President of The Lakers, a team he reigned during Pat Riley's Showtime era, owned during the Kobe Bryant era, and now runs in the newest LeBron era. He owns The Dodgers, and watched them enjoy a World Series run last year that fell one game shy of shifting a 30-year MLB Championship drought. He owns the LAFC, the newest entrant to the Major League Soccer franchise with a brand new stadium in Downtown LA that sells out on a regular basis. And he’s part of the team that just got The Olympics to come back to Los Angeles in 2028. 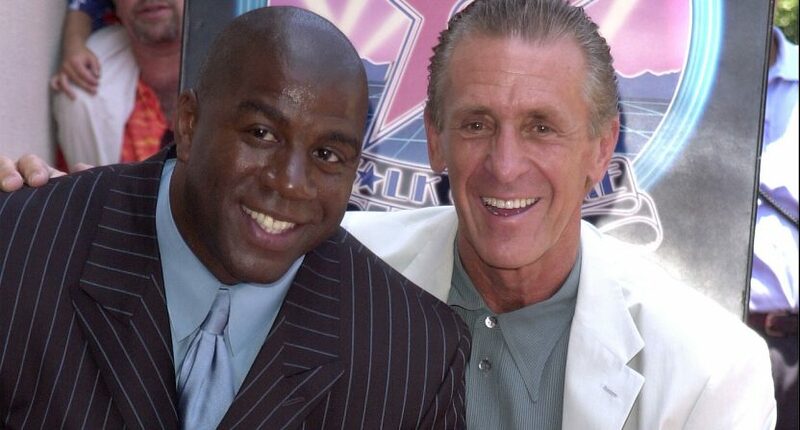 Magic could easily be the Mayor of Los Angeles if he didn’t have the same amount of successful business ventures (foodservice, insurance, healthcare, and more) taking up even a bigger slice of his time. And he speaks. Thank goodness he speaks. With a passion and an energy and a gift like none other. From the moment he's introduced by a video showing the highlights of a brilliant sports and now business career, to a riveting talk that takes place not on your stage but throughout your audience, to the selfie line that your attendees will line up for afterwards, an appearance by Magic Johnson at your convention isn't just a speech, it's an event. And if you're planning a meeting or convention here in Southern California, there is no better Welcome to LA keynote speaker than Magic Johnson. This is the first in a series of articles on top-choice keynote speakers for your conferences in key cities. More articles to follow from Dallas, New York City, Chicago, Nashville, San Francisco, Las Vegas, Orlando, and Scottsdale. We're prepared to deliver high-profile keynote speakers on-budget and on-theme for your next meeting.